The following was published on www.oregonsportsnews.com on 9 August 2013. For whatever Karmic reason, this question that has come up innumerable times throughout the past year of my life. Sometimes the answer is simple and mundane; sometimes it’s cloudy and convoluted. Other times, the answer is simply handed to me, as if Big Brother has been watching me or reading my thoughts. This happened one day in Yoga Camp during a minor existential crisis, in which I jottedWhy am I here? into my notebook. The answer came to me from a friendly voice across the room. Big Brother in this case was in fact not a creeper or terrifying government watchdog, but a teacher I look up to with great respect and admiration. He announced the answer I was searching for as if directly on cue. 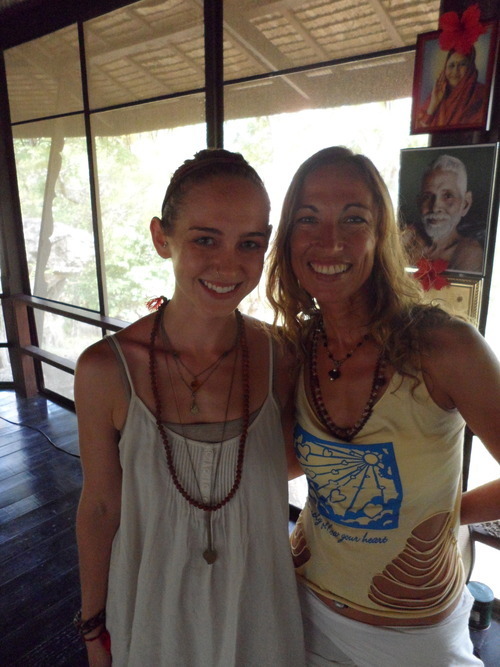 It was my last day of yoga philosophy class in Thailand. I began intensive yoga practice last year with just that intention in mind – long before learning about sva dharma, burning Karma through meditation, or the “auspiciousness” of full moons. Although I started practicing yoga when I was twelve years old, it wasn’t until last fall that I realized I needed to commit to a change in my life. I decided that change would be through yoga – a practice I’d long felt connected, but never fully committed to. Sva dharma, a Sanskrit word for our natural state, is why we’re here. In other words, it’s You Doing You. Why else should we be here than to live life as our truest selves? To be “all that we can be” and reach our highest potential, as my teacher would say? Sometimes that means taking a step back and simply witnessing all that is in order to “wake up.” For some of us this means silent meditation or practicing in a yoga class while for others it may be running, biking, swimming, CrossFit, or simply “alone time” to decompress. While it may be difficult to take the time, patience, and silence away from daily life, it’s a vitally important aspect of why we’re here. Are you here to work overtime and stress eat while worrying about bills? Are you here to watch Keeping up with the Kardashians reruns? Or are you here to commit to a greater potential? To “wake up” to all that you’re capable of? As I continue my yoga practice on and off the mat, I encourage you to do the same. Work hard; sweat; find some kind of practice. Take a moment of silence and unearth what speaks to you. Don’t just ask why you’re here. Discover your yoga, your sva dharma. Go do you. Sat Chit Ananda and Namaste, friends. The following article was published on www.oregonsportsnews.com on 25 July 2013. Yoga is my quiet time. Rather than laying comatose in bed with a package of Oreos and the complete series of 30 Rock on Netflix, I attend yoga class to decompress. My practice is a time for me to feel good about myself, my abilities, and to push my physical body just past the limit I usually think possible. So when a song comes on during class that reminds me of an ex-boyfriend, I may need to stifle the urge to punch the teacher in the face. I moved back to the United States nearly five months ago. I constantly find it hard to believe that I’ve been back this long and I’m still struggling to accept the differences between a culture I grew to love in Asia, and this culture I grew up with and returned to. 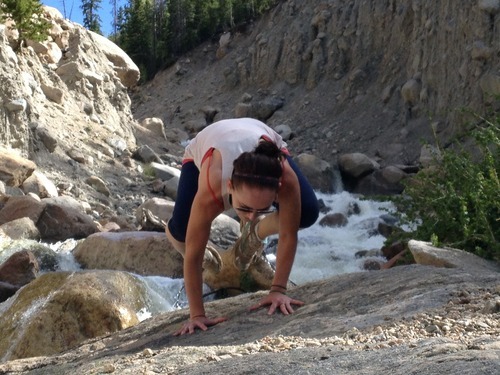 It’s also been a constant battle to find a steady yoga practice within the United States. Perhaps it’s just part of re-adapting to American culture, but I’m really not used to everyone talking so much during yoga. I’ve become faced with the seemingly obvious, but sudden realization about yoga classes in this country: they’re all about language. I come from a yoga background and personal practice in which I avoid speaking during class or listening to any words but right, left, hand, and foot at all costs. If it doesn’t involve a body part I should move, I don’t really want to hear about it. As both an English teacher and a devoted yoga practitioner, I find it easy to get caught up in language. My meditative asana time isn’t really set aside for me to hear your personal opinions about my ego or how I should let go of judgment, dear yoga teacher; it’s finally a time during my day when I don’t have to lend a friendly listening ear, so please, just shut up. When I lived in South Korea, I found a teacher who I grew devoted to. I attended her classes every weekday. She didn’t speak much English. I loved her. American teachers are different, however. Since moving back to the United States, I’ve had a hard time finding anyone similar. Me: It’s hot as Hell in here and I’m sweating my face off, dude. Don’t tell me to play like a squirrel. I loved my classmates and experiencing their different styles of teaching throughout my Yoga Teacher Training in Thailand, but not once did anyone talk about squirrels. Forrest Gump and double rainbow references? Plenty. Memories of ex-boyfriends via sad acoustic music? Thankfully not. I know there are good yoga teachers in America, and I’m currently on a quest to find them. Beer-asana and Pink Floyd Yoga may work for some people, but they don’t get my chakras vibrating. So I’d like to know, what’s your experience with yoga classes in America? Have you found a teacher who you can devote your time and sanity to? The following article was published on www.oregonsportsnews.com on 11 July 2013. I recently started working at a preschool. One of my greatest and wisest friends once mentioned this and I’m constantly reminded of it now: small children are like tiny drunk people. If you’ve ever been near one of these itty bitty, messy, wobbly, nonsensical, smack-talking tots, you may have an idea of what I’m talking about. They walk into things. They fall over. They’re loud and they get angry for no apparent reason. They have shmutz on their faces all the time and they don’t seem to care. Now before I make these children sound like little psychos, I will mention that they’re hilarious and very kind, imaginative souls. They do use one phrase, however, which I can’t stand and have a personal vendetta against. These two words seem to be a mantra for many of my students. This is particularly true at the age of five and below, especially when it comes to creativity, trying new things, andplaying. My eye started twitching at the lack of “please” in this command. Did this five-year-old really not know how to draw a heart? And demand me to do so? “I’m going to draw it here and then you draw it onto your paper, okay?” I told him. “No, I can’t,” he replied. I not only went on a rant about size, ability, and “trying our very best” at this point, but about feminism. To a three-year-old. As I watched one of my two-year-old students teeter past me one afternoon, knocking everything over in sight, his complete lack of balance reminded me of my current mental state while practicing yoga asana. Although finding balance is difficult, it’s a goal I strive for. My physical yoga asana practice has been calling for attention for months now and instead of thinking “I can’t,” I just need to know I’m ready. Although I’ve struggled to find a class, teacher, and studio I feel at home with, there’s no reason to give up and claim inability. All of the excuses in the world can fill up time and space in my head, but in the end, my hamstrings will continue to tighten, my body and mind will ache for its practice, and I’ll always feel that lacking and aching need for my missing daily asana time. Although I’m sure I’ve used the dreaded “can’t” phrase more recently than I think, it’s one I consciously try to ban from my thinking. We are what we think and what we put out into the world will come right back to us. There was a time last year when I did say “I can” a lot. I said it so much that I’m now a certified yoga instructor and y’know what that means? I can fix my tight hamstrings. I canbalance my own dang asana. So as I roll out my mat, step back into adho mukha svanasana, and hold for longer than is ever comfortable, my mantra will once again be I can. The fact of the matter is, you’ll never be able to do anything unless you try. Stop making excuses. Stop expecting anything. Rely on that person who has always had it in them and start trusting yourself, because you’ll never be able to say “I did” unless you stop thinking “I can’t” (at least that’s what I’d tell my preschoolers if they’d listen).